One winner will be chosen at random on July 10th. You can view the place cards by clicking here. As with all of Blush Paperie's products, our place cards are completely customizable. You will be able to pick the design, the color, and the font. Your guests name (and table number if desired) will be printed on the place card for you. My favorite is Damask, very classy! My favorite is Vintage Bird (although Anemone is a close second)! Our colors are dark teal and seaglass green. Gosh! It was hard to pick just one! But, if I had to pick ONE, it would be Whimsical Scroll. My wedding color is light sage green (some would say it's the color of organic green lentils). My favorite is the Vintage Border and my colors are chocolate brown and lilac. There are so many great designs to choose from! Oh my gosh I wish I win! Favorite design is Feather and would love it in the Aqua color to match our color choices!!! Even though they are very different- my favorites are vintage bird and modern branch. My colors are eggplant and moss. Our favorite is the Bee Place Card, but all of them are pretty spectacular. Our wedding colors are Navy Blue and Canary Yellow...the Bee would look awesome in either color! Congrats on the new Place Card Line! 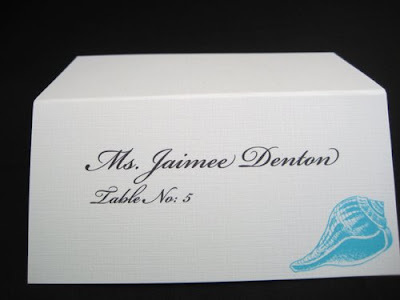 I love the Ballroom Place Card but with aqua ink. What a wonderful giveaway! I love love the trellis design, it would be beautiful in our colors like your celedon green and with slate or navy blue font. Thanks! My favorite is Vignette. I love the color and design. Our wedding colors are blue and eggplant. My fiance and I absolutely love †he Trellis design! The chapel in which we are getting married is surrounded by Dogwood and Magnolia trees that will be in bloom at the time we get married. We even based our wedding colors on those flowering trees! We would love to have the Trellis design in Moss with the Brugues script, if possible. Our wedding colors are Moss/Clover/Emerald green with accents of blush pink and white. Plus, we are having a small wedding, and would more likely than not need less than the total number you are offering. Bonus for you! Feather! Our colors are chocolate, gold and ivory. I love love love the cherry blossom! Our wedding will be held at a very modern French restaurant with a lot of Asian influences. These cards would be perfect! Our colors are Red and Mango. I love the Vintage Bird card :) We'll be getting married outdoors at an arboretum so the bird design is fitting for our outdoor theme. Our colors are dark teal, marigold, and chartreuse. Damask Border goes greatwith our Save the Dates and website! Our colors are Chocolate Brown and Celedon. My favorite is "whimsical" - it's a lovely, versatile place card that will coordinate well with romantic/rustic weddings. Wedding colors are chocolate brown, khaki, and muted raspberry pink. My favorite is Whimsical. Our colors are magenta and gold. Damask is classy, not to mention totally chic these days. That's my favorite (and looks like my invitations!). Our colors are red and eggplant. Well I love New Orleans and Feathers but my favorite would have to be vintage scroll because it matches the decor of our venue perfectly! Our colors are matte silver and hydrangea blue with hints of marigold. My fav is the Whimsical Scroll. It would go great with our monogram that has kind of a scroll border. Our colors are black, white and dark red. I love the romantic style! What an amazing giveaway! My favorite is the Whimsical Scrool Design. These would be perfect for my Rehearsal Dinner! Our wedding colors are browns, reds, oranges, yellows, very fall oriented. The Rose Garden would fit perfectly since the invitations have a Rose Hip Design. The main wedding color is bright magenta. I love the English Garden Damask.. my wedding colors are aubergine and champagne! 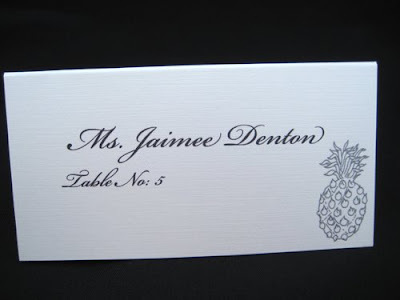 I love the B&W Damask Place Cards. All of them are beautiful. It's hard to pick one! I love "Ballroom" it is so pretty. Our wedding colors are chocolate brown and lime green. Fun designs! So pretty! We're getting married in next June and would love love LOVE to have Rose Garden there with us. Our colors are antique pink, plum and charcoal. I think my favourite has to be Seashell, though it's a really close tie with starfish. We've not really got wedding colours as such, but white, royal blue and gold seem to be turning up a lot! These are just lovely! We are using mason jars with wildflowers, so the Bee design would be really fun. Our colors are blue, yellow and navy. Thanks for the generous giveaway! Love the rose garden! Our colors are light blue and cream with pops of red. My favorite is vignette... and it's already in my main color! Other colors for our wedding include different shades of blue and a pop of red. We're getting hitched in August (37 days) and place cards are the one thing I still have yet to check off my list. It's a garden wedding, so either the Bee or the Dandelion would be *perfect*. Our colours are chartreuse and turquoise (but I think I would want the place cards in chartreuse...the tablecloths are turquoise silk)....wheeee! I love the damask border! My wedding colors are chocolate brown and sage green. I adore the vintage bird! We are having a vintage-inspired, farm wedding and this design is perfect! Our colors are a dark ivory, with different shades of purple, and a few touches of green. Thanks for the giveaway! English Garden Damask is beautiful and would look perfect in my venue! Great giveaway! It was so hard to chose but I have to say the Whimsical Scroll looks the most like my invite design. It's beautiful! Our wedding colors are burgundy, gold/champagne, with touches of pink and brown. Damask is definitely my favorite. Definitely like the Damask the best. I want to incorporate the Damask pattern throughout my wedding and this will be perfect. Our colors are black, white and raspberry. I love the New Orleans! My colours are royal purple and white. New Orleans -- I LOVE the funky feathers!! Our color palette is merlot, cream, and powder blue for a crisp November wedding! I like the cherry blossom! Colors are red and orange with some purple. I absolutely love the New Orleans placecards and they would be appropriate since we've been to New Orleans together! Our wedding colors are purple and silver. My favorite is damask because my invites look just like it. :) My colors are navy blue, white and silver!!! Our favourite are the damask placecards, because they complements our black and white damask invites. Our other wedding colours are teal blue and sunny yellow. The trellis design makes me swoon!! It is perfect for our sunny yellow/ French blue wedding. I hope I win!! Congrats on your new cards, they are uber pretty. My pick would be the Ballroom cards. Our colors are Chocolate brown, champagne, and accents of burnt orange. We are having a fall wedding! They are all beautiful, but I think my favorite is Whimsical Scroll. Our colors are yellow, gray and dark purple. Congrats on the new line! My favorite is the New Orleans! Our colors are navy blue and hydrangea green and white. This is perfect for us because while we live in New Orleans, our wedding is going to be in Wisconsin, which is where most of our family is. I love the seashell and and starfish designs. We are leaning towards a casual luau theme for our wedding so they would be perfect. Our colors arent 100% set yet, but hot pink will most likely be one of them... Great placecards! We're doing a bird and garden theme with a touch of vintage. I love the Vintage Bird (of course, I would love half and half with the Whimsical Scroll in a perfect world). Our colors are multiple shades of pale silvery blues and lavenders with accents of chocolate brown. These are just gorgeous. I love feather, it matches the architecture of our reception venue! Our colors are dark peacock blue, pink, and bright yellow. I love the Whimsical Scroll place cards the best! They are so beautiful! Our colors are navy blue and ivory, with an accent of pink. I love, love, love, the bee place cards. They would look perfect at each setting next to our homemade jars of honey that we're giving as favors. Our wedding is in the fall and our colors are dark army green, rust, eggplant, and gold. My fiancee has worked so hard on the details of our wedding; I'd love to be able to surprise her with these! She's Vietnamese and incorporating Asian-fusion elements (food, origami, a traditional ao dai dress) throughout the big day. The "Cherry Blossoms" would be absolutely perfect. We have a burgundy and ivory color palette. I LOVE corner scroll. I think it would look perfect with our colors maroon, pink, ivory and gold. The vintage bird style matches our theme perfectly. My mom always refers to us as 'the love birds' so i'm sticking with that sort of theme with mainly navy blue as our color with hints of lighter blues to accent. I like the english garden damask. Our colors are yellow, white and light blue. Thanks so much for letting me know. This is for my best friends wedding. I think she would love the Starfish or Shell and her colors are brown, tan, and Turquoise. The modern branch is so perfect for our wedding! We're doing a backyard soiree in gold, pink, sage, and chocolate brown. My fav is the damask. My colors are lime green, grey, and crisp white. They would look great! I love the dandelion one! All of them are very cute though! Our colors are yellow and gray. I love the seashell. It's so simple and different! They are all gorgeous! I love the Whimsical...but like everyone said, it's so hard to pick just one. Our wedding colors are peach and chocolate brown! The Bee! It would fit with our nature themed mountain wedding perfectly! Wedding colors are peach, pink, and butter yellow. These are all so lovely! My favorite is the Modern Branch, though. We're having a fall wedding; our colors are plum, mustard, suit blue, and espresso, and the branch design would work very well with our theme. I really like the ballroom style. Our colors are going to reflect sea glass, so sea foam green and a light blue. So hard to decide... but I love Dandelion - whimsical and fun - just as we hope our wedding to be. OUr wedding colors are Tangerine and Navy. English damask is a delight. We're using rose and gold. Thanks so much! I love the simplicity of the modern brand design. A nice touch of flair without being too busy! 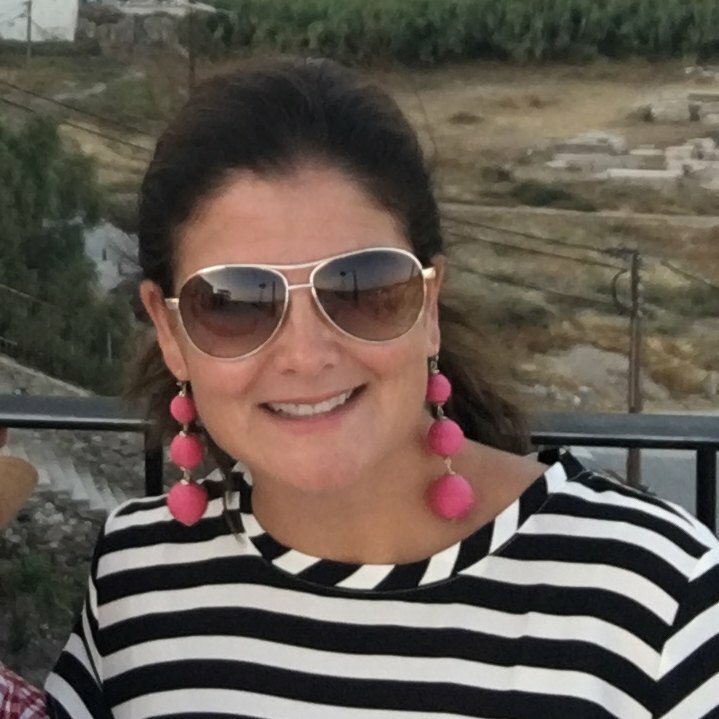 We are getting married in Bermuda this September... so our colors go with the colors of the country - navy, pinks and green. Our wedding colors are red and yellow. Thanks for having this contest! i love so many of them but whimsical is my favorite + it matches the theme of our wedding. our colors are deep cranberry (like a merlot), cream, blush and black. I love the Vintage Border! Our colors are black, gold and ivory. I love the pineapple!!! Sooo cute!!! Our colors are pink and bright green!! My favorite is the starfish design. This design would go perfectly with our seaside themed wedding. Our colors are blue, tan, and white. I would have to say (after much deliberation) that our favorite place card design is the Whimsical Scroll (the Vintage Bird came a close second!). Our wedding colors are bright blue and pale yellow (like your color options Blue and Yellow). These designs are great - thanks for doing a giveaway! I absolutely adore the whimsical scroll. Our wedding theme is "if I threw a Midsummers Night Dream-themed garden party in the gardens of Versailles" and it is sooooo hard to find things that are beautiful and opulent, yet whimsical and light-hearted. The whimsical scroll is actually the first design I've seen that gets it perfectly! Vintage border is my fav. Our colors are green, black and cream. Our favorite is the seashell place card and our wedding colors are yellow, orange and latte. Thanks for the giveaway! Vignette has to be my favorite...it does a beautiful job of feeling both classic and a little bit ethnic...exactly the look that my Turkish fiance and I are going for with for our deep purple, black and cream vineyard wedding! My favorite has to be the Romantic Place Card. Our wedding is going to be a garden type wedding with our colors being blue and brown. They are all beautiful though! i love the whimsical pattern. perfect for my vintage inspired wedding. they would be perfection customized in navy&lavendar. what a great giveaway! My favorite is Whimsical Scroll. My colors are ivory, black, burgundy, and gold. I love these, but my favorite is the Dandelion design. Our colors are Apple Green, Chocolate brown and ivory. Cherry Blossom or whimsical scroll and my wedding colors are a soft yellow, dark gray with navy trim! All the designs are beautiful butI would have to say that either the whimsical or cherry blossom is my favorite. My wedding colors are cream, black and pale pink. I love the rose garden and the cherry blossom cards. gorgeous! My fave is modern branch! I love the vignette design. Our wedding colors are navy blue, lavender and gold. My favorite is the Romantic design but the Dandelion is a very close second. Our wedding colors are purple and tangerine. My favorite is the Whimsical Scroll. Our wedding colors are shades of pink and celadon! My favorite is the starfish. Wedding colors are navy and apple green! Whimsical Scroll would be perfect for our wedding - simple and elegant! Our wedding colors are blue-gray and yellow, so Slate would be our color of choice for the cards. Congrats on your new line! I like the cherry blossom - our colors are a mix of pinks & purples. These are gorgeous! The English Garden in green is perfect for my wedding in Santa Barbara next spring! My favorite is Ballroom - would be beautiful for my pink/silver ballroom wedding reception! I love the uniqueness of the Pineapple design-- designs like that are hard to find! Our colors are cobalt blue with yellow accents. I love Rose Garden, they would look gorgeous set amongst the vintage glass vases on our weddign tables. Colours are peach and sage. I absolutely love all of them. To choose just one is almost unfair. I think I have to go with the butterfly ones though. I just love butterflies! Our wedding is February of next year. Our colors are light blue (blue jay), lavendar, and white. Love the damask...it would be perfectly suited for my Summer, garden wedding of black, white, lime green with hints of coral/peach. Oh, a girl can dream! I love the Damask. I like all of them, but I think that would fit best with our wedding. Our colors are teal and chocolate. Anemone for sure. It looks like a vintage botanical drawing. And the flowers themselves are so striking. My colors are fig, slate and blush. My favorite design is the Bee! Our wedding colors are berry, peach and champagne. I really like the rose garden. Sunflowers will take center stage, and the rose garden is the closest to a sunflower. Our colors are yellow and green. I *big puffy heart* the feather design. It's perfect for our vintage, romantic, garden style wedding! I would love to win these! I am so excited to see the Trellis cards with the dogwood! I want to include the dogwood in my CA wedding, because it's my home state's state tree (Missouri). My colors are plum, dusty lilac and cream. I couldn't believe that you guys had a card with an anemone on it! These, and gerbera daisies, are the primary flowers that will be featured throughout my outdoor wedding! My wedding colors are plum, lime green and magenta. These cards would look so amazing in any of those colors. Yay!! My favourite is the cherry blossom design. They are all very stylish but cherry blossom reminds me of the spring that my fiancé and I got together. Our colour scheme for the wedding is royal/electric blue, silver and white. My favorite is definitely whimsical scroll... very classy without being boring! My colors are eggplant, ivory and gold. my favorite is the Vintage bird! I think it is just great. Love birds have always been a running theme in our relationship, so i think it would work really well. our colors for the wedding are tangerine and pale robin's egg blue. we're going for a summer garden type theme for our wedding. My favorite is Vintage Bird! Our colors are red and aqua. They are all lovely, but it's an easy choice for me...the Butterfly! Seeing that I'm a fan of so many colors, we are using many different ones for our October wedding. Lilac, green, white, with touches of yellow and hot pink. PS I actually picked my wedding venue because while my fiance and I were touring the space, two butterflies followed us around. It was meant to be. Thanks for considering my entry. I love the damask ones. they are so elegant and beautiful and would be perfect for my wedding. I love the whimsical design! Our colors are pink, ivory, and gold. Whimsical Scroll caught my eye and believe it with make a statement at each table. Our colors selections are not complete yet but we were leaning towards evening wear and tuxes in grey . . .
2. your wedding colors-not sure as of yet!